If this were ancient Greece, having the Hydra wrapped around you would be less than ideal. For real. That thing was mean looking. Fortunately for us, it is 2014 and the Dainese Hydra Flux D-Dry Jacket is a very good thing to be engulfed within! Showing up on the scene as a design update over the original Air Flux Jacket, the Hydra version comes with a removable, waterproof D-Dry liner for those days when the rain arrives in force. Constructed of a combination of Boomerang mesh and Quick Dry fabric, this jacket utilizes removable composite protectors for motocentric protection and comfort. Velcro adjusters at the cuff, neck, and waist allow for a more custom fit while extremely clean lines accentuate the European cut of the jacket. There is also a women’s specific version of the jacket that more closely matches the men’s version than previous iterations of the Air Flux. The Dainese Women’s Hydra Flux D-Dry Jacket offers all of the same features as the men’s jacket, yet with a fit made for female riders. Fear not the Hydra! 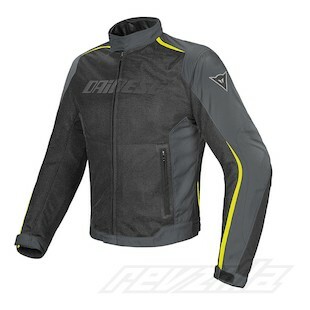 Welcome it, embrace it, and keep an eye out for it in the new Dainese lineup for Fall of 2014.